FX Networks is a free FX Networks Windows 8 app available under ‘Entertainment’ category of Windows 8 store. Here, in this FX Network app for Windows 8 you can keep yourself updated with all the up coming shows and blockbuster movies on FX Networks. 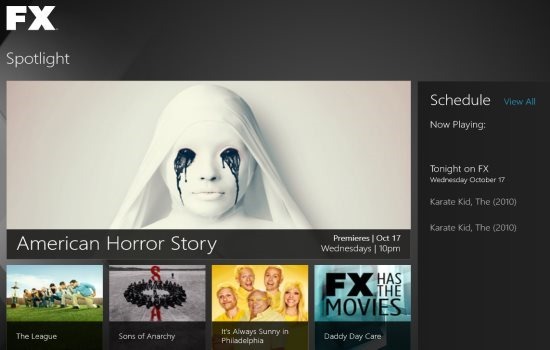 This FX Networks Windows 8 app lets you track the schedule of all your favorite shows on FX Networks. The interesting part is that you can set a reminder to watch your favorite show on its scheduled time. Also, you can mark a show as your favorite. A separate ‘My Collection ‘ column for your favorites have been given where you will find all the shows or movies you have marked as ‘Favorite’. This helps you not to search for your favorite show every time you want to watch or to check the scheduled time. What I really found interesting here in this FX Networks Windows 8 app is the beautiful column-based tiles interface in a full screen mode. As you open the app, you will find four categories: Spotlight, My Collection, FX Originals, and FX Movies. You need to scroll the mouse wheel to the right (or use the horizontal bar) to view all the categories. Click on the show or movie you want to know the schedule timings of. Here on this screen, you will find options to mark the currently opened show as ‘Favorite’ and to set a reminder for watching the show at the scheduled time. On the main screen, you will see the ‘Now Playing’ option to view what is currently playing on FX Networks. In addition, you can also share the show with your friends via Email, Facebook, or Twitter. The sent item will get opened in the FX Networks’ website. Similar apps: Movies App, Slideshow Maker For Windows 8. Once you have successful download the FX Networks app, open it. The very first time when you open the app, it will ask you to set for how do you receive your FX programs. Select between Cable & Satellite. Also, you have the option to switch between Cable & Satellite. To Shift from Cable to Satellite or vice-versa, press ‘Win+C’ to open the Charms bar ? Select ‘Settings’ from the Charms bar menu ? now, click on ‘App Settings’ for shifting. There you go. Press the combination of ‘Win+Q’. Type ‘FX Networks’ and press Enter. You will soon find the app extracted from the store. Click on ‘Install’ button to download the app. There you are… the app the been successfully installed and placed in Windows 8 start menu screen. Go ahead and download FX Networks Windows 8 app now.